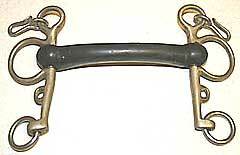 The aim of using Pelham bit on a horse or pony is to combine the action of a snaffle and a curb bit. This is done by the means of one mouthpiece to which two reins are attached. The Pelham bridle is not generally accepted in the realms of classical riding but the fact remains that many horses and ponies go extremely well in one. On the basis that any bit which suits a horse and rider is a good bit, the pelham bit should not be over-looked. In general, the Pelham comes into its own on a horse or pony which tends to be a bit strong. A pelham bit can often suit a horse which goes well in a snaffle 99 per cent of the time but needs more control on special occasions eg when out hunting. Critics of pelhams claim this bit tends to encourage a horse to set his neck and jaw against it instead of flexing it correctly from the poll. It is true that you often see horses, and especially children’s ponies, which have been put in a Pelham to provide the rider with extra brakes, using the muscles underneath the neck to fight the bit - but any bit can be misused. The mouthpiece controls the pressure on the horse's tongue, bars and roof of the mouth. A pelham bit may have a jointed or solid mouthpiece. A solid mouthpiece may range from a straight mullen mouthpiece to a medium port. A mullen mouthpiece pelham places an even pressure on the tongue and bars of the mouth. A port provides more room for the tongue, but puts more pressure on the bars. A high port can act on the roof of the horse's mouth where it touches, and acts as a fulcrum - increasing the pressure on the bars of the mouth. Jointed mouthpieces on a pelham have a nutcracker action which increases the pressure on the bars. Unlike a jointed snaffle bit, having a jointed mouthpiece on a bit with cheeks, like the pelham, can be very severe, especially if the pressure from the leverage of cheeks makes the joint of the bit roll forward and press into the tongue. 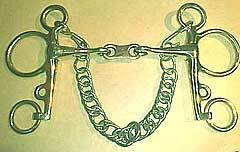 The curb chain is used to apply pressure under a horse's chin. Acting as a fulcrum it increases the pressure on the bars of the mouth. The curb chain on a correctly fitted pelham should lie flat and hang loose only coming into action when pressure is applied by the curb rein. The longer the cheeks, the more leverage will be created when the curb rein is used. To get maximum benefit from a Pelham, a rider must be able to use two pairs of reins, as with the double bridle, and understand that each has a distinct action. The curb rein, especially, should be used with delicacy. Sometimes a Pelham is used with leather pelham roundings which enable the rider to have a single rein which is then attached to both the curb and snaffle rings on the cheek of the bit. Obviously this is useful for anyone not happy using two reins but it does make the action of the bit rather indistinct and could even be said to render it useless - but, if your horse goes well like this and is comfortable - who?s to argue? The usual rules for fitting bits apply to Pelhams, which should always be used with a curb chain and lip strap and NEVER with a drop noseband. Jointed, rubber, vulcanite, happy mouth, mullen, french link pelham, myler pelham, pelham bridle, vulcanite pelham, waterford pelham, french link.